Because I feel guilty for not writing something fabulous after my ten day absence, I will share pictures of my new, beautiful room. Admit it, you were dubious, right? It turned out even more beautiful than I had hoped, though of course, taste is subjective, and you may disagree. That's okay. It's not quite finished. There are a myriad of small details to attend to. 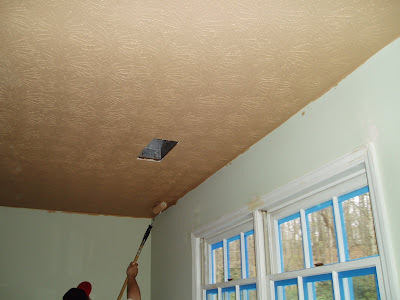 The nail holes in the molding need to be puttied. 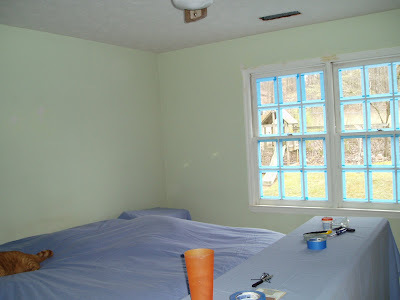 I still need to paint the window panes (note the blue tape still adorning the windows) and the door insets. I have to paint and replace the ceiling grates. I haven't hung all the artwork yet. The cheap shades will go. I absolutely LOATHE blinds and refuse to have them in my house. The shades are an interim measure until I can afford some really good quality window coverings. I found some beautiful Roman shades that were the perfect color, but they were $189 PER WINDOW. My furniture is ugly. I loved it 16 years ago, oddly enough. Maybe it's just that it's wrong for the room. It needs something a tad more formal and sophisticated. Unfortunately, new furniture is not in the budget, so I will try to update it by changing the hardware and refinishing the tops. My mother bought me a ridiculously expensive but incredibly gorgeous silk floral arrangement, which I can't decide where to place. 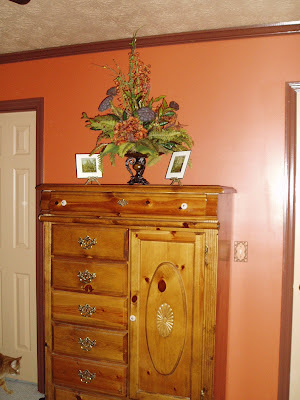 It looks awesome on top of the highboy, but it also looks amazing in front of the mirror. Tell me what you think. 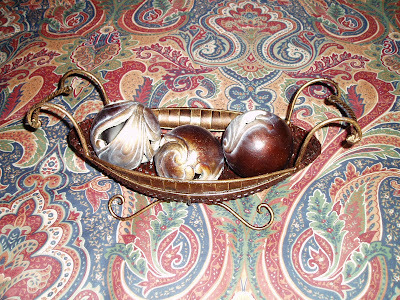 I have it paired with two small brass etchings that I bought from a street artisan in Paris when we were there on our honeymoon. I love them very much. I also have beautiful grave rubbings from Notre Dame that I plan to have framed and hung in there, but again...the budget prevails. Have you priced custom framing these days? OY. The ceiling fan RAWKS. It really just changes the whole look of the room. Don't you agree? It was one of the things I thought I would have to wait for. It was expensive, because everything I pick out is expensive. I can walk into any store and without fail, choose the most expensive item, every single time. To test my unerring ability, I chose another ceiling fan at random, and it was exactly the same price. I chose the two most expensive models in the store without even glancing at a price tag. 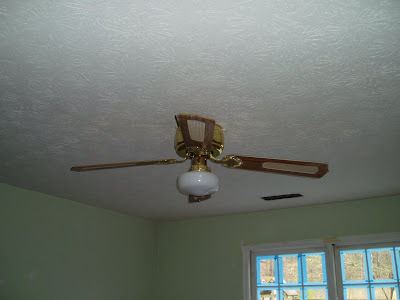 Knowing how much I loathed the fan that was in there, and how it made me physically ill to see my beautiful room marred by it's hideous 1984 brassiness...he surprised me last week by "finding" money with which to purchase it. Ahhhh. But mostly, it's done. And I LOVE it. I was concerned about the ceiling color. It was Husband's idea and I was skeptical. But I have to say, it really WORKS. I didn't think so until the molding was up and then it all came together beautifully. White would have been wrong. So, so wrong. Envision this room with a white ceiling. Wrong, right? So, the moral of the story is...take risks with color. I'm glad I did. But even if it had turned out horribly, all that was lost was some time and a little paint. Oh and also? Do yourself a favor. 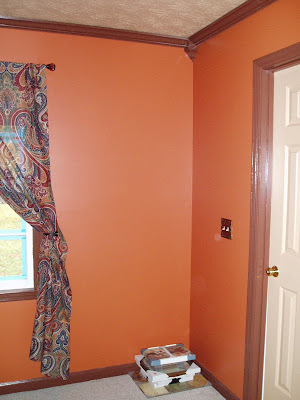 If you decided to paint trim a dark color, for the love of all that is good and holy in this life...PRIME it. 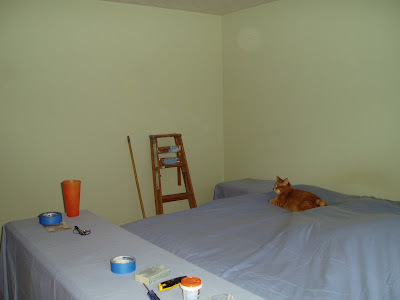 Ugly, sickly (and dirty) mint green walls. 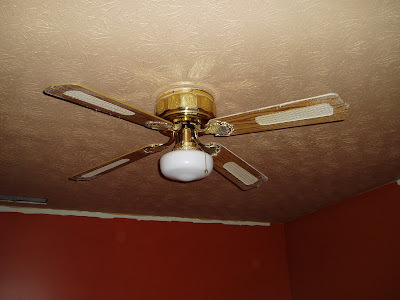 Hideous brassy ceiling fan and fixtures. DOH. That ceiling looks mighty dark! Will it work? Or did we make a BIG mistake?? YES! It worked. And June looks right at home. Weird doo dad I bought on a whim that I now have no idea what to do with. 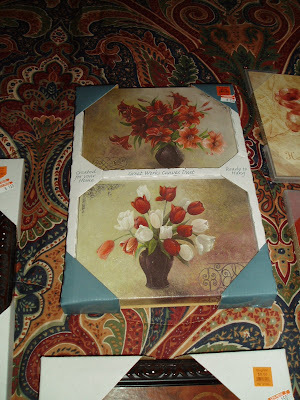 Wall Art that I found in a bargain bin for $1.50 ea. I swayer! I like these the best. They sorta, kinda, almost look like real art. So there you go. My magnum opus. Now the attached bath looks REALLY shabby, and I'm chomping at the bit to get started on it. Wish me luck. But damn, when all this is done, I'm not going to want to move! P.S. I wanted to mention, that this was not an expensive project. You can make a big visual impact without a big price tag. 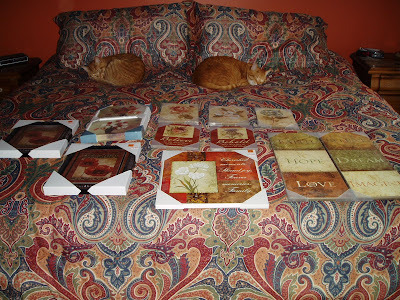 The bedding was $30 from Domestications. The matching curtains $24.99. 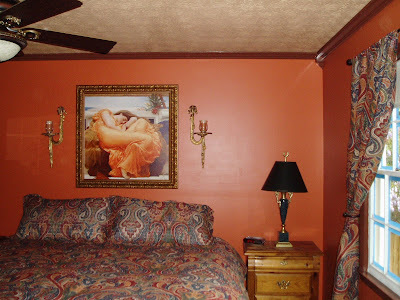 The mirror, the painting and the wall sconces I'd had for years, they were just repurposed. The weird little doo dad I got at Wal-Mart for $10. I did splurge on a few items. The ceiling fan and the outlet covers were expensive. 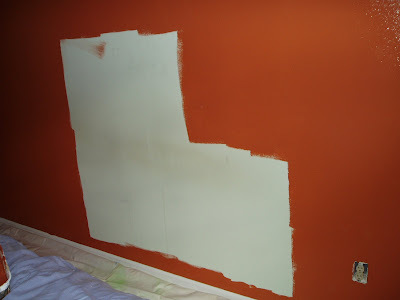 We also splurged on good paint because we learned when painting Pubescent One's room that cheap paint is difficult to work with. So, almost $100 for paint. 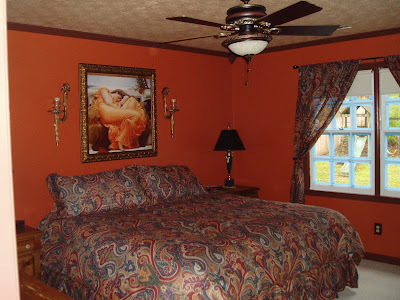 And crown molding is an inexpensive way to make any room look luxurious. We used four pieces of 16 ft molding that were around $13, if I remember right. The corner blocks were $3. You can update and beautify for very little if you take the time to shop and compare. Beautiful room. Flowers are best on the highboy - they spoil June's reflection when they are in front of the mirror. Very nice! It looks warm & cozy & luxurious. I agree w/ Anonymous--put the flowers on the highboy. Nice work. Looks like you put a lot of thought into it. Now come over and give me advice! Love it! So warm and inviting. June is pleased. I like the flowers better in front of the mirror myself. you have no idea how i envy you sleeping underneath Flaming June. Darling, anybody can sleep beneath June! Get yourself a June. She makes me infinitely happy. 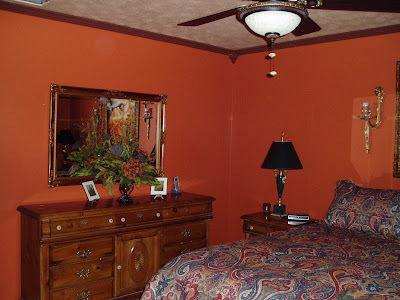 I say put the flowers on the highboy and the "weird doodad" on the dresser. I love that orange! What paint is it? It looks lovely!! I love how June looks on the wall, and the color of the ceiling works very well. Beautiful! it looks very serene and welcoming, and I'm happy to know I'm not the only person who decorates with framed grave rubbings! I love it. I think the silk flowers look fabulous in front of the mirror. I think they would get missed on the highboy. Like I said before BA, absolutely fabulous! You have fantastic taste. Congrats on your new room. You deserve it, sweetie! It's perfect! She looks just great and very at home in her new space :) I bet you love it! Lovely room. They're not colors I might have chosen but they do look great together and compliment the painting beautifully. In my opinion, the flowers look best on the highboy. I'm glad you're happy with the results of all your hard work! The mouldings finish it definitely. So cool to see June up! Two suggestions : Replace the white enamel knobs on the furniture with matching brass ones - it will help take away the slightly country look it has. The empty corner either needs a tall plant, or pehaps a corner bookshelf or etagere. Try your local Craigslist - you might find something that could pe repurposed with just a little paint. Love it! You're inspiring me! I love it. LOVE LOVE LOVE IT!!! Oops! Now I see the two! This is really marvelous. What great taste you have! Your comments about loving the various pieces reminds me of FlyLady's dictum to only have around you the things you love, not stuff that makes you feel bad, or guilty. LOVE it, nice cozy retreat for you! Love the dodad too, maybe you need a thrift store run for a skinny table/pedestal deal-paint it to match the colors and stick it on top in that lonely corner!